Using logs to troubleshoot doesn’t have to be so hard. What is happening on devices right now? Perform near real-time troubleshooting with near real-time log streaming from any device in your network. How can I see when there was a spike in activity? Quickly identify hot spots of activity across your environment. Why did we get the blue screen of death? Better understand what was happening on your Windows devices before they became unavailable. Powerfully designed and intuitive log aggregation, tagging, filtering, and alerting for effective troubleshooting. Fully integrated with Orion Platform products, enabling a unified view of IT infrastructure monitoring and associated logs. What are log management tools? Log management tools collect device logs, events, and traps from network devices or servers for monitoring and analysis. Your infrastructure continuously generates log data to provide performance insights, and monitoring logs in real-time can help give you the immediate insight you need. Whether it is syslog, SNMP traps, or monitoring Windows event logs, these log files can provide the critical pieces of insight you need to help with troubleshooting. Monitoring, collecting, consolidating, and analyzing log information using one tool can help you find root causes faster. SolarWinds Log Analyzer was designed to be the log management and analysis software you need to help keep your network and business up and running. Log Analyzer can help you easily filter your monitored log data. Once you collect the logs, you can refine them via intuitive, out-of-the-box filters. 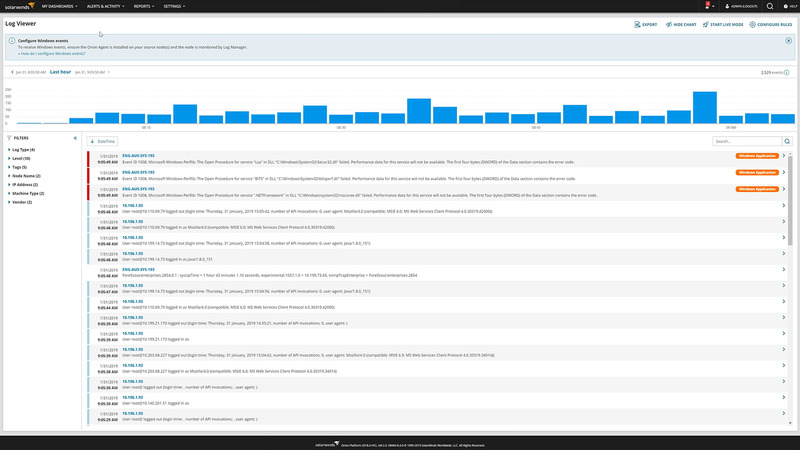 Using the powerful search engine built into Log Analyzer, you can quickly find the log entries of interest and save valuable time. Log Analyzer is designed to give you the capability to quickly visualize log volume, search results, and refine timeframes via an interactive chart. Since our log management software is integrated into the Orion Platform of products, you can seamlessly integrate the log data you’ve monitored and collected with Log Analyzer into the Orion Platform console, so you can view it alongside network and systems performance metrics. Unifying your log monitoring data and infrastructure performance can help give you a clearer view of your network’s performance.